Chaplain Earl Smith has ministered to wildly successful professional sports teams (the Golden State Warriors and San Francisco 49ers), as well as prisoners on Death Row in San Quentin for many years. He presented to Barnabas partners in February about his new venture—a transitional housing facility for men re-entering the civilian world after serving time in prison. He currently operates Concerned About Recovery Education (CARE) out of a home his family bought in Stockton four years ago. It’s home to 16 former inmates, including nine who were originally sentenced to life. For instance, if a resident backslides into drug use, the government rules require him to be kicked out—just at the time he is ripe for a serious conversation with Smith. It hurts his pastor’s heart and he is planning to transition Franklin Street from a sober living home to a licensed drug and alcohol treatment center. These are numerous challenges working with these men including such simple basics such as many had no identification when they were sentenced to prison and still don’t have it after being released 22 to 28 years later. The system releases them without any form of government identification. The long-term needs are for housing, job placement, educating in life skills and substance abuse and workshops on family re-unification. He gave partners an open invitation to a one-day tour at their individual convenience. The pastor also was direct that the biggest need for inmates and those released is a conversation experience where they come to know Jesus—nearly three-quarters do not know the Lord. Given his chaplain relationships with the 49ers and the Warriors, he has celebrities to tap into. Former 49ers Kevin Green, Eric Wright (who attended the Barnabas meeting) and William Floyd have all hung out with the residents. Earl was eager to hear from Barnabas partners on ways for the professional teams to be involved with the transitional housing residents consistently. He also invited partners to help develop a business plan and re-examine the program plan. Thirteen partners attended the session that was facilitated by Len DiGiovanni. Bob Lindberg is serving a coach to Smith. Government funding covers about 75 percent of monthly operating costs of $33,000. To expand to a second facility, it will take about $1.7 million. Partners encouraged Smith to take a broader strategic view with the idea that Franklin Street becomes the model for a system that could be “franchised” across the state and potentially the nation. He was encouraged to hire a chief operating officer to run day-to-day operations, so he could be freed up to use his high profile to raise money through a proposed Earl Smith Foundation. Other actions steps were: build on-site counseling center for income stream; pull together people who think strategically for a 1- to 3-day retreat to create vision and strategy; create a mini-plan for COO and work on franchise model and develop a board. Earl was invited to return soon to a Barnabas meeting with a specific list of roles he needed filled. Coach Bob Lindberg has focused Earl to a strategy of building a business plan that provides sufficient detail and focus to attract a quality management team, board and fund-raising strategy. 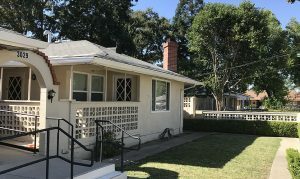 A key idea is that there will be a Phase I house (existing 16-bed Stockton Sober Living facility) and a new 8-bed Phase 2 house which will, on a combined basis, allow 32 parolees to utilize the housing facilities over a year. CARE will also gain revenues from state mandated counseling sessions required for each of their 32 housed parolees throughout the year. The counseling business should also generate income from sessions held with other non-housed parolees. The Stockton house will be considered a model franchise and subsequent CARE expansions will replicate the operations strategies in Stockton. The business plan is a work in progress.